While San Francisco is no stranger to the ever-looming threat of a catastrophic earthquake, a recent discovery of intersecting faults under San Francisco's San Pablo Bay has dramatically increased the risk of a major earthquake in the next thirty years. Scientists at the U.S. Geological Survey published their discovery this week in Scientific Advances. The Hayward Fault has long been considered a threat because it runs under densely populated neighborhoods east of San Francisco. The study found that beneath San Pablo Bay, it joins with a Rogers Creek fault, a less active underground fracture to the north. 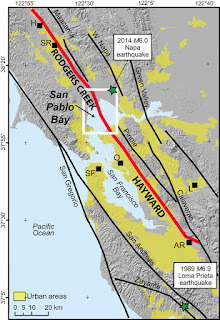 This newly discovered direct link between the faults raises the possibility of a simultaneous rupture of the Hayward and Rodgers Creek faults, a scenario that could result in an earthquake up to a magnitude of 7.4 that would cause widespread property damage, extensive loss of life, and far-reaching ripple-effects on the global economy. The relationship between these two faults had long been unknown. Detailed subsurface imaging, geophysical interpretation and kinematic modeling by the U.S.G.S. team demonstrate that the Hayward and Rodgers Creek faults are directly connected at the surface. The Hayward and Rodgers Creek faults combine to represent a continuous 118 mile-long fault. If they were to break simultaneously, they could produce a magnitude 7.4 quake. “You have to understand that there are over 2.4 million people living right along this fault, and the population of this whole area is around 7.5 million. It also turns out that major transportation, gas, water and electrical lines cross this fault. So when it goes, it's going to be absolutely disastrous." Mr. Ponce was also quoted as saying that there is a 32% chance that such a quake could occur in the next 30 years. Speculation regarding California earthquakes and “the next big one” is hardly anything new, but with the Hayward-Rodgers Creek discovery this week, it appears we have a new front-runner for how that “big one” could originate.